All you Lu-fans ought to know that Scott's latest project -- This Diminishing West -- has just released their first full-length track online! The demo song is called 'Nine Years Of Tunneling' and is currently posted on their MySpace page. So... what were you doing on this day 10-years ago? A decade!? I'll give you a moment to think about it> Sitting at home washing your hair? Desperately searching for reruns of Punky Brewster? How about crying to yourself because your folks wouldn't let you go to a show in Seattle, WA? The rest of you, perhaps, were with us -- Old Lincoln High School in Wallingford, USA -- for the original "Final Performance" of Poor Old Lu. For those of you who have the CD of this show, "In Their Final Performance" -- and no you can't have a refund! -- it doesn't quite recreate the 'magic', if you will, of that evening. Poor Old Lu played for over 2 hours, 20+ songs, and even included an "acoustic set" mid-way through. We were also joined by several "special guests" including Jeremy Enigk, MG the Visionary!, and other backup musicians. It was a great time with many friends. "What's going on with the Lu guys now", you ask? Many of you know, of course, that Aaron has been very busy recording and producing many great, great projects. Personally, I think that Aaron is getting better with each album that he works on. Good stuff! Also, you ought to have heard of Fair by now - the new band featuring Aaron and Nick. If you haven't heard their album yet, please stop what you're doing, go and buy it, listen to it 5 times, and then come back to finish reading this page. Oh yeah... it's really good! Jesse has been busy as well - including many groups that he plays with. Perhaps you've seen him at a show lately? He's still living in upstate New York - far, far away from the rest of us - but we still talk to him on a fairly regular basis. He's no stranger!! Lastly (but not leastly), what has Scott been doing? Well, it's high time that we let you know that he has been working on a new project. The band is called This Diminishing West and they are working some demo recordings that they hope to release in December. You can find some updates from Eric, their bass player, here on their MySpace page. What does it sound like? When are they going to play? We're not even going to go there. In the meantime, here is a sample clip of one of their songs, "These Emotions Will Move You, Son". Enjoy. Thanks for reading. We will talk to you soon. On a totally different note, you may be interested in knowing what Jesse has been up to! Is your curiosity piqued? Yes? No? Either way... move that mouse this direction and click this link to check out Jesse's new studio, The Illuminata, located in Dansville, New York. Very cool building, nice gear, and so on. If you're interested in booking some time with Jesse and the gang, please email him - [email protected]. Got it? Good. Friends and fans.... the store is now closed. POOR OLD LU MERCHANDISE SALE STARTING TODAY! If you've been waiting for the right time to purchase some uber-groovy Poor Old Lu swag, now is that time! We're looking to liquidate the remainder of our inventory, including: t-shirts, posters, glossies, and stickers. Everything is at least 50% off and all prices now *include* shipping! Get two t-shirts for only $10, six stickers for only $2, and on and on. Act fast, though, 'cause when this stuff is gone we're closing down the store! A quick (and shameless) plug for Aaron's new CD, Lackluster. Released on Tooth & Nail Records February 10th, this new CD is actually a compilation of previously released material from Aaron's first 3 albums -- with one new song, Pillbox. The rest of the tracks aren't entirely old either as some have been remixed and a few parts even re-recorded. Other songs on this album include: Really Something, Solace, and What Sorry Could Be. Never heard Aaron's solo stuff? Do it now. You'll dig it! Been a fan for years? Grab a copy and give it to a friend. Spread the joy. Aaron... has been busy recording, engineering, producing, and so on. His most recent project have been the sophomore releases of Kutless (BEC) and Demon Hunter (Solid State). Both albums will be released in the coming months. Also, it appears that Aaron is working on some new solo material and will release an album on Tooth & Nail... when he gets some free time! Aaron and his wife, Karina, celebrated their 10-year anniversary earlier this year! Their son, Elliot, is now 9 years old. Jesse... is now back in New York! He and his family moved back in November and will pick up where they left off. We're sad to have them so far away again, but that's how things go. Jesse has also been drumming quite a bit. Most recently he laid down drum tracks for the new Demon Hunter album "Summer of Darkness". He has also been seen drumming for Serene and The Lashes. You can catch Jesse (and the rest of the Demon Hunter guys) in their great music video "Infected" via MTV2's website or on www.demonhunter.net. A new video is scheduled for early 2004. Jesse is also working on a new album for The World Inside -- perhaps a mid 2004 release. Lastly, Jesse is working for a non-profit record label called Six World Records. Cool stuff. Jesse and his wife, Amanda, have two daughters -- Mirabelle and Gretta. Nick... has been busy with his day job in commercial real estate. He also rocks the flock on bass for the worship band at our church every Sunday morning! Nick has also been playing bass in the studio for various projects *and* will likely be on Aaron's next solo project. Lastly (and in family news), Nick and his wife, Jen, will be celebrating their 9-year anniversary this coming May! They have two children, Ethan (4) and Josiah (1 1/2). Scott... is pretty much doing the same old stuff. During the day, he works as a network administrator. The other portion of his "work" is in leading the high school youth ministry and college groups at his church, City Calvary Chapel, where Aaron and Nick also attend. He can also be found leading worship for both groups (and occasionally the Sunday morning service). The rest of his time is spent at home with his family and in keeping the house from falling down. Scott and his wife, Sam, will celebrate their 9 year anniversary in June. They also have three kids: Sebastian (6), Trinity (3), and Brighton (8 mos). Thank you, friends, for your prayers and words of encouragement. Our little boy, Brighton, is doing extremely well. We were able to hold him for the first time on Friday evening. As of yesterday he started taking breast milk. He has been active, alert, and healthy. All we can say is... PRAISE JESUS! There is no great explanation for all of this with medical science -- it is purely the hand and grace of God. Brighton is still in the Infant ICU, but we're hoping that he might be able to come home later this week. 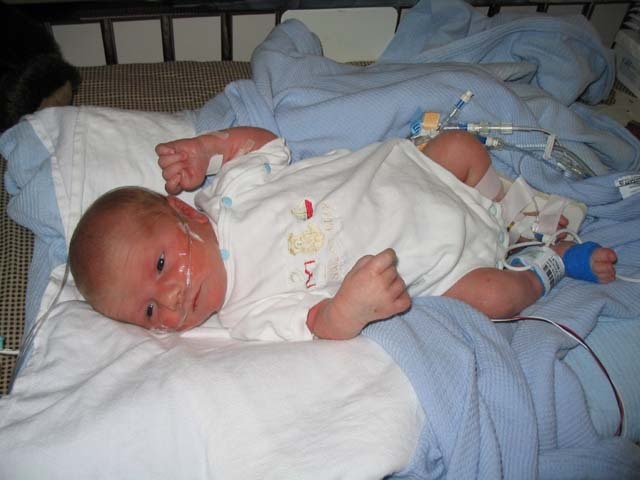 A small picture of our little miracle baby. Thank you again, friends. Please pray for us, friends. I (Scott) took my wife into the hospital on Sunday afternoon to check on our soon-to-be-born baby who was significantly less active than he had been. Although his pulse seemed fine, the doctors felt that he was in distress and ordered an emergency c-section. A few minutes later, our baby boy, Brighton Thomas Hunter, was born, though not breathing. The doctors quickly resuscitated him. It looks as if he had major blood loss inside the womb, thus lacking much needed oxygen as well. If we had waited even just 2 or 3 more hours, he certainly would not have survived. Unfortunately, we are not out of the woods yet. He has at the Children's Hospital Infant Intensive Care Unit (here in Seattle) where he is in very stable condition, but we are unsure of any damage that may have occurred. He is moving around, opening his eyes, and is responding to our voices, but still has a ways to go. Our friends and family have been very supportive in this extremely difficult time. Please pray for Brighton's full recovery and for strength for my wife and me. There are a number of reasons, my friends, for this update: 1) We would all like to thank you for your prayers for little Gretta Sprinkle. She is back at home, safe and sound with her parents. She is doing much better. 2) I was thoroughly chastised via email by one fan for the lack of updates. Alas, my apologies cannot suffice. 3) We are at war, my friends. Whether you agree with this action or not, it is at hand. Please keep this country and our soldiers in your prayers. There is no major news on the Lu front. We're hoping to get a couple of shows scheduled. More on that as we know more on that. Please keep little Gretta Sprinkle, Jesse & Amanda's youngest daughter, in your prayers as she is in the hospital right now fighting a respitory infection and may also need heart surgery. Please pray for her safe recovery and for peace for the rest of the family. Poor Old Lu would like to wish you all a very Merry Christmas. May the Lord bless you and keep you as you draw nearer to Him. Thank you to everyone who attended our CD Release Party, and to all of those who attended in spirit. We had a great time -- truly! Our set was 17 songs long, including 5 tracks off of the new album, "I Am No Good" (from 'Sin'), and "A Forest" by the Cure, to name a few. Josh Tillman opened, followed by Seven Head Division -- and they did a great job. Hopefully we'll have some sound bites to post in the near future, if the recording came out well. We'll let everyone know, of course. We'd also like to thank the Paradox, Tooth & Nail, and all of our friends for their help! 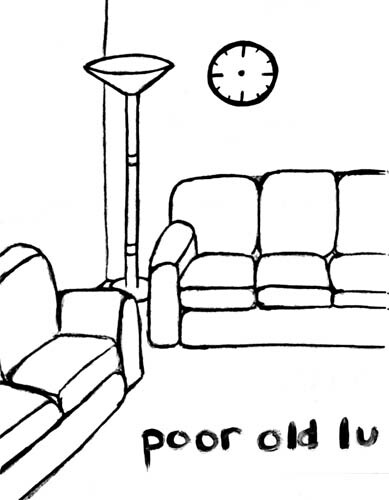 In site news, we've added the "Poor Old Lu - The Waiting Room" poster to our online store page. It's very cool... so grab one while you can! Also, we now have more sizes available in our t-shirts, so see if we have the right fit for you! Friends, family and all.... join us this evening for a time of music and celebration. The Poor Old Lu CD Release Party starts at 8PM. We're poised to do our very best... bringing out some of the old material (songs, that is) as well as the new "Waiting Room" stuff. This should be a show that any and every Lu fan could enjoy! We're certainly looking forward to it. Also, joining us will be our good friends, Seven Head Division. You'll love 'em. Seattle, WA. 8PM. The Paradox. Well, my friends, the day has arrived. September 24th, 2002 (today), is the release of Poor Old Lu's latest album, The Waiting Room. It has been a long time in coming, but I think you'll find it well worth the wait. This album was most certainly a labor of love as we toiled for many months to get it finished -- in the studio, out of the studio, and back in. The finished product is new, familiar, strange, and completely Poor Old Lu. Also, the artwork is beautiful thanks to our friends at Tooth & Nail. We are happy to finally release "The Waiting Room". Enjoy. Here are a few links to purchase the CD online. We hope to eventually have our CDs available from *our* online section, but it might be a few weeks. In the meantime RUN OUT AND GRAB THE NEW ALBUM WHEREVER YOU CAN!!! This is a big day, so I'll leave you to mull over today's events. Take care. We played Portico (formerly TomFest) this past weekend and had a great time! There was a good crowd and a good vibe... and everyone (except for a praying mantis -- long story) had a great time. Next up on the Poor Old Shows roster, of course, is our CD Release Party. We'll be playing on Friday, October 4th, at The Paradox -- the same location as our March 2001 show! Joining us will be our friends from Seven Head Division -- a great group from upstate New York -- and another artist/band to de decided (no solicitations, please). Please click here to get more information on the show *and* to purchase tickets online... 'cause this baby is gonna be packed! Oh, yeah... we also have an album coming out in less than 3 weeks! That's right, folks -- less than 3 weeks! Can you believe it? Our latest project, The Waiting Room, will be released (and should be in stores) on Tuesday, September 24th, put out by Tooth & Nail Records. Those who've heard it thus far have loved it, so hopefully that is indicative of how well it will be received. We'll find out soon, I suppose. Ummm...that's it for now, I guess. Talk to you soon. Finally, we've got the Portico (formerly TomFest) show coming up in about two weeks. That should be a great time. Also, we've tentatively scheduled our CD release party for Friday, October 4th, at the Paradox in Seattle. We'll post more information when we have more information (and when tickets go on sale). That is going to be a great, great time. Don't miss it! We have a few changes/additions to the website to announce. First of all, there is now some information about our new album, The Waiting Room, that will be released on September 24th. Check it out! Second, I've updated the "Store: @shows" and "Store:online" pages to reflect most of our new merch. The pages are nearly identical now, but you can get an idea of what we've got available. We don't have a good purchasing system in place, but if you can pay via Paypal, then go ahead and browse the merch, pick out some stuff, add it up (+ shipping), and send payment to "[email protected]". Contact me if you have further questions. Lastly, I've finally made *something* out of the "Audio:mp3s" page! There is basically a sampling from each of our albums (and a few extra), so please give it a look-see and download to your heart's content! As far as upcoming shows are concerned, we will be playing at Portico (formerly TomFest) next month, so check it out. We will also post the information for our CD Release Party when we have it -- sometime in late September. First of all, THANK YOU EVERYONE for all of your great t-shirt entries for the contest! We were surprised to have received so many entries... and so many great designs! Alas, we had to choose just one design. The final winner is.... Trilisa! Check out her winning design here. Her design was drawn by hand, scanned in, and emailed to us and we especially liked it for its simplicity. She will, of course, get many great prizes from the Lu guys! Also, her t-shirt will join 3 other designs that will be offered at our upcoming shows. Great job, Trilisa -- thanks!!! Speaking of Cornerstone, we will have a promo CD featuring Poor Old Lu & Serene for sale at our booth! This limited edition 4-song CD features two songs from the upcoming Poor Old Lu album, "The Waiting Room", and two great tracks from our friends, Serene. It will also feature some really groovy full-color artwork! It'll cost about $5 and might only be available at Cornerstone, so get 'em while you can! Lastly, it's just about time for another clip from the new album, ain't it?! Here's a snippet from a new song called "Today". Prepare yourself... it's mellow and (dare I say) pretty?!?! Enjoy. That's all for now..... but we'll be keeping in touch!!! On another note, we're looking for some great designs for some new-Lu t-shirts! We have several shows coming up this summer that definitely call for new shirts, stickers, and whatever else. We're calling on our faithful Lusers to design something great that we'll make into a t-shirt! - That new shirt will be at our upcoming shows! - Contest ends on June 1st. What is the title of the album? We've chosen the name "The Waiting Room". This could change, I suppose, but that's unlikely. When will the album be out? We don't have a firm street date yet, but it should be out by Cornerstone -- so early July at the latest. How many songs will be on the album? We're not sure of the exact number, but you should expect 11 or 12 new songs! What does the new stuff sound like? Hmmm. We're probably the worst people to ask, since we're so close to the whole thing, but it probably sounds closest to the sound we had on "8th Wonder" -- though totally new and totally Lu. Where are you guys recording at? As we've mentioned in the past, this album is being recorded and mixed at Compound Recording in Seattle -- the studio that Aaron manages/engineers/produces at. Can we hear something off of the new album? I'm glad that you asked! We have a link to one of the new tracks, "Now". This clip is only a rough mix, so it will likely change a bit before the album comes out, but it shows how things are shaping up. Take care, all -- and God Bless! I'll post some samples as I get 'em. It has been nearly two months since the last update and, unfortunately, I don't have much to report! The album is coming along, be it ever so slowly, but it will get done. When we have the (updated) release date, I will let everyone know... 'cause I'd like to know myself! In the meantime, you can pickup a copy of Tooth & Nail's "Happy Christmas Vol 3" album featuring Poor Old Lu, Aaron Sprinkle and many others. All in all, a nice compilation. Besides that there isn't much to say. If you have some free time, then take a moment to stop by the Poor Old Lu Message Board (hosted at CCMChat). Merry Christmas and Happy Holidays from us all. 1) A reminder: ...we have a show coming up this Friday, October 5th, at the Liquid Lounge (at the EMP) in Seattle. As part of the Northwest Passage 2001 music event, Tooth & Nail is the featured label with a few of their local bands. The lineup is: Coy, Poor Old Lu and Ambitious Career Woman. It starts at 9:00PM, it's in the Liquid Lounge and it's absolutely FREE! Oh, and one other thing... it's 21 and over *only*. I know, I know... our hordes of underage fans will be very upset, but we can do nothing about it. For the rest of you, come hang out with us for an evening! Go here for more info (scroll down to the October 5th headline). 2) Some good friends, Debbie and Trilisa, have posted some very nice pictures of Poor Old Lu from recent shows. Since we're so incredibly bad at taking/posting pictures, this may be the best way to get 'em. Visit those sites (and let 'em know you like 'em): Debbie's 1, 2 or Trilisa's. Thanks to both of you! 4) Lastly, Tooth & Nail is releasing their newest holiday collection, Happy Christmas Vol. 3, featuring Poor Old Lu and Aaron Sprinkle (among many others), very soon. We've posted a short clip of Poor Old Lu's track, 'What Child Is This?'. Download the .mp3 here. The album is coming along, of course, albeit slowly. It seems that the release date is being pushed back, which may *really* upset some of you. Why is that, you ask? Well... it's for a few reasons. First of all, with Jesse in New York the writing process is much more difficult. We're hoping to have the drums laid down for all of the songs this week! After that, Nick, Aaron and I can work fervently on our parts. Secondly, we really want to give this album the time that it deserves. The folks at Tooth & Nail are more interested in a *great* album than just getting an album out quick. So are we. We believe strongly that this album will not only be "up to Lu quality", but the best album we've ever done. To that end, we want to devote more time to the entire process. As clips become available, we will post them here... I promise! What can be said, my friends.... very little, yet so much. We, of course, send our deepest prayers to those who have been so tragically moved by the recent events in our country. We pray that Jesus Christ would be lifted up and glorified through this all. He is the Way, the Truth and the Life. Amen. On a more positive note, we have a show coming up shortly in the Seattle area. Have you heard of the EMP? Well... that's where we're going to be playing on Friday, October 5th. As part of the Northwest Passage 2001 music event, Tooth & Nail is featured on that evening with a few of their local bands... we would be included, of course. The other bands are Coy and Ambitious Career Woman. It starts at 9:00PM, it's in the Liquid Lounge and it's absolutely FREE! Be there if you can, ok? Go here for more info (scroll down to the October 5th headline). Take care, all -- and keep in prayer. Errr............ I've done it again. Two months since the last update... sorry 'bout that, folks. So, "what's going on" you ask? A bit, actually. We just got back from the Purple Door Fest in Pennsylvania. Very cool. Though I mocked their "mountain", as they say, it was really a great time. Cool place. Good weather. Great people. Fun show. Etc, etc, etc.. I also wanted to thank the staff at the Purple Door Fest -- they were some of the most pleasant people we've ever dealt with at a music festival! Thanks, all. Also, thanks to all the fans who supported us there (and put up with our lame jokes and such) -- the show was really great! Lastly, you'll notice that we have NO shows posted on our website. That's because we have NO shows scheduled. I realize that everyone would like us to be playing shows in their living rooms RIGHT NOW, but we just can't do it! :) Seriously, though, we are using all our spare time to write and record. After the album is completed we will talk about new shows, but we cannot schedule any until then! My... it HAS been awhile, hasn't it?! I would like to apologize as always (I do that a lot, don't I?) for not updating as regularly as I should. What's my excuse, you ask? No excuse. Just busy (and lazy). After the shows we took some time off to just relax and gather ourselves once again. Lately we've been practicing for the upcoming Cornerstone shows.... next week! We have (2) sets out there. The first set is on Tooth&Nail Day (Tuesday, July 3rd @ 9:15PM), and the second set is during the day at the Indoor Stage (Thursday, July 5th @ 2PM). Strangely enough, the second set is the exact place (and almost exact time) as the very first Cornerstone show that we ever had... way back in 1994!!! Oh, the memories. What else are we up to? Well.... Aaron is finishing up his next album. Jesse just released a double-disc (kinda... it's The World Inside and Seven Head Division... two albums on one disc!). Nick has been playing with Aaron during his live shows, and I've been doing the usual -- family, youth group and work. Oh, we've been writing songs too! Yes, yes -- we've been writing songs. It's a strange thing, actually, because none of us have written songs like this in a long time. It's going to take some time for us to figure it all out. To be honest, this album is going to come together much differently than our previous projects... partially because it has been so long, but also because we're so far apart. I trust that it will come out great, just different than before. That's ok. In the meantime... we're getting ready for Cornerstone, TomFest and the PurpleDoorFest (later on in August). See you at the shows!!! Thank you, all. The shows were great! Need a recap? Last Saturday, March 31st, PoorOldLu got together for (2) shows, and again for (1) show down in Olympia on Sunday, April 1st. Saturday's 2PM show was, of course, a bit nerve-wracking after "4 1/2 Years" (inside joke), but it was really great fun. It didn't take us long to get the old energy back. About 350 people crammed in to the Paradox to hear Yellow Second open up with a great set, then kindly waded through our own 15-song set, complete with two songs we've never played -- our own "Weeds That Grow Around My Feet", and Adam Again's "No Regrets". Good Fun. Saturday's 9PM show was also very cool. We were, of course, extremely tired, but I think it still had great energy. A few more than 350 people (again) crammed in to hear Wes Dando's set, which was great, and then our own 16-song set (we played Army Guy! ), which was almost exactly the same as the 2PM show.... sorry, we've only rehearsed a limited amount of songs at this point. :) The last show of the weekend took place in Olympia, at Calvary Chapel. Less people, but for a Sunday evening it was very good. We probably played better at that show (technically), though it didn't have the vibe of the Paradox shows. That's OK. Probably the best thing about this weekend was getting to see so many people -- and to hang-out and talk. We signed some stuff, took pictures, etc.. Really a great time! Thanks again, everyone, for making this last weekend so memorable! Tomorrow is the day, my friends. After 4 1/2 years, PoorOldLu is doing another show.... or three. We've spent fairly considerable time planning this show, doing what we can to make sure that everyone who *really* wants to be there CAN be there. We think the venue, though small, will contribute to a great atmosphere for this much awaited event. We've also put time and energy into making the sure that the product (shirts, etc.) are up to Lu quality! Lastly, we've been practicing our tails off to be prepared to play these shows! Though we certainly haven't practiced as much as many bands do, for the usual PoorOldLu routine we've practiced quite a bit! Needless to say, we want to sound good, have fun, and make these shows memorable......... I think they will be. Go here for all the show info, and go here for the info on the product. We'll see you there! Some of you may have noticed some downtime for the PoorOldLu site here. I apologize for that, but there was little that could be done. The line provider for my DSL service, Northpoint, filed for bankruptcy, and, of course, my DSL went off-line. I pushed the pages to another line *pretty* quickly, but there may be some residue issues. Also, the e-mail has been temperamental, so if you have troubles e-mailing us temporarily, that's why. I hope to have all the issues worked out soon..... but my home DSL service is another issue entirely. Sniff. Well... the day looms nearer and nearer. Is the excitement too much for you? Can you hardly contain yourself? Hopefully no one is THAT bad off, but it should be a great time. The 2nd show on March 31st is also selling very well! Both shows should be very packed and very crazy, not to mention the Olympia show on April 1st (no, it's not a joke)! Go here for all the show info! As always, check out TicketWeb for online sales for the 2PM Paradox show ( the 9PM show is sold out, of course). As promised, we have posted pictures and info online for our merchandise and such, that is, what we'll have at the upcoming shows. Check out the STORE:@shows page for all that goodness. The pictures are small and stuff, so go ahead and click 'em for a larger version! Need a brief run-down? We'll have (3) different shirts there, (2) of them being limited edition. We'll also have a limited edition run of the official poster, each hand-signed by the band and numbered individually! Crazy. Lastly, we'll have some brand new stickers for your "sticking" enjoyment... errr..... something like that. We look forward to seeing you all........... very soon. Nothing much to say at this point, just keep in mind that we've added a 2nd show to our March 31st date! That makes a 2PM 'Matinee' show & a 9PM 'Original' show. Check out TicketWeb for online sales for the 2PM (and the 9PM show is sold out, of course). We've also added the info for (3) other shows: (1) for an April 1st show in Olympia, WA (yes, the day after our March 31st shows), and (2) dates at this year's Cornerstone festival. We will be playing during the Tooth&Nail Day *and* on the Indoor Stage. Should be great! Check out all those dates on the shows page, dig? Lastly, we've gotten a lot of people asking about guaranteed tickets to the March 31st shows. Unfortunately, we cannot help people out much with this. The 9PM show, as many of you know, has sold very well online. So much so, in fact, that the online sales had to be cancelled so that some door sales would be possible. Because of this we added the 2PM show that same day. The online sales for the 2PM show are still up and online (for now). Door sales will be possible for that show as well. We, of course, want *everyone* to get into both shows, but it just won't work. I would personally like to apologize to all of you who have had a difficult time arranging tickets, etc.. A bigger venue would've been a wise idea, we realize, but we didn't expect such an overwhelming turnout! "What?" you ask? By popular request, we have added a 2nd show to our March 31st date! That's right!!! We now have a 2PM 'Matinee' show & a 9PM 'Original' show. Why is this? Because the original show sold so fast, so quickly that we were really leaving a lot of people out in the cold... literally. With the matinee show, everyone *should* be able to get in somewhere! As of right now, the 9PM show is no longer being sold on the web, but some tickets can be purchased at the door! Also, the 2PM 'matinee' show is available for online ticket sales... check out TicketWeb for that. - Those who purchased tickets online for the 9PM, March 31st show will get in for sure. - A number of people who arrive at the door for the 9PM show will be let in as well, many will not. - Those who purchase tickets online for the 2PM 'matinee' show will get in for sure. - Assuming the 2PM show doesn't sell too quickly online (it may), most people should be able to get in at the door. All you people out there are absolutely horrible! NO ONE bothered to mention that the PoorOldLu site looks atrocious in Netscape! YUCK!!! I loaded up Netscape today to test out another side project, and decided to check out PoorOldLu.com -- and to my surprise........... OUCH!! In any case, now I know and I'll try to fix as much as I can. Unfortunately, I'm very happy with the design and I don't want to mess with it too much. There is another issue with the nav bar menu: on Macs the top (flash) nav says "loading..." until you refresh the page once more. Not sure why this happens, and I've never seen it on any PC running Internet Explorer, but nonetheless it exists. I'll do what I can.... any ideas would be helpful! For those of you who don't know yet, we had a fairly major earthquake in the Northwest today... centered just about 40 - 50 miles south of Seattle (or so)... and it registered around 6.8! The question on everyone's' minds, of course... is Poor Old Lu ok?! (just kidding) But we are fine. I (Scott) was with my family at the time, in the Seattle Aquarium essentially underwater with just concrete, pilings and lots of water and fish above us. A horrible place to be. Jesse was recording a guitar track for his upcoming album over at Aaron's house when it happened, so it was all captured on audio! Check out that wacky earthquake madness (on MP3) right here! (hint: turn it up loud!) Nick, I guess, was at work, but I imagine he's just fine. Meanwhile, California has the rain and Seattle has the sun and earthquakes. Crazy, man, crazy. Also, we have some upcoming shows planned (aside from TheParadox, which is no longer selling online tickets, as I understand, only walk-up tickets for the night of the show) including two shows at Cornerstone (Tooth & Nail Day + a normal C-stone show) and the TomFest (somewhat pending). We will be supporting the new album with some shows around the U.S., but ARE NOT SCHEDULING NEW SHOWS at this time. I know that a lot of people would like us to play in their area, but we're just not ready to schedule any shows or dates. When we are ready, however, we will post it right here on the site! Lastly, please continue to check out the PoorOldRadio - it's always a fun thing. Liner notes are coming... slowly. In the meantime, check out the cool notes we have for Mindsize and Eighth Wonder! Fun. We're just doing our thing... trying to get ready for the March 31st show at TheParadox. Be there. Also, I've been making some updates to our website here, so dig it! First of all, you'll notice that there are now some pictures on the images:band page -- kinda cool. I'm working on getting more... it just takes time. Speaking of... please send those pictures in if you have 'em (read below)! Also, I've started adding liner notes to the lyrics... slowly. Mindsize and Eighth Wonder should have 'em all. Fun reading and such. Lastly, PoorOldRadio is online and pushin' out the wacky beats! Go check it out, why dontcha!?! By the way... if you have any "technical" issues with PoorOldLu.com, please e-mail me at [email protected] and let me know -- I'll try to fix it (if I can). So... "what's going on with Lu?" ... that seems to be the great question these days. Well, it's basically as we wrote earlier -- we're doing a new album, we'll be playing some shows, and the site has been redesigned for your viewing pleasure! The plans for the show at TheParadox are coming along well (note: ticket sales have been *extremely* good, so keep that in mind), and we're still trying to schedule everything else. We'll have the shows page updated as soon as we have more info. Also, I've (Scott) been writing liner notes for all of our albums *and* all of our songs. They're not posted just yet, but I hope to have at least some of them up there soon. What are they for? Just notes on the backgrounds to the songs, recording details, stories, whatever *and* insights into the lyrics! Cool reading type stuff. - .jpg (jpeg) files only, please. - please, no more than (5) pictures per e-mail... 'cause things get crazy! I'm going to try to post every picture I get, but that's not reasonable. Also, I'll do my best to give everyone credit (somewhere) for their picture(s), so please make sure to let me know who you are. This'll be a nice way to get cool pictures up on the site for EVERYONE to see! Thanks, all, we love you! Well, folks, here's where it starts... the beginning of a new look and feel for the PoorOldLu website! Crazy, eh?! The *original* Lu website came online in 1997, about 7months after the Final Performance show (go figure). There hasn't been a whole lotta need to redesign the site until now, I suppose. For starters, the site is in need of a serious makeover. Secondly, were looking at a new album sometime this year! Yep, that's right... a NEW album. What's that mean? New songs? Yep. Some shows? Yep. Does this mean that PoorOldLu is back together? Not really. It's not our intention to keep things going necessarily. We feel strongly about putting out a new album *and* we know that it's only sensible to play some shows in support of the new album. When? Where? We can't really say right now. It looks like Cornerstone is a for sure thing this summer, so you can almost bank on that. We plan on having other shows afterward around the country, but we don't know where, and we don't know when. As of this time, we have a show booked at TheParadox in Seattle for Saturday, March 31st. Go here for more show info. E-mailing us to figure out further show info is pretty fruitless at this point... 'cause we just don't know. Sorry. What about this new album? Well... we *have* started practicing/writing, if that means anything to you. We are just about to sign a contract with Tooth&Nail records for one album (and potentially more, who knows). They have been very supportive of what we'd like to do. They've given us time to write, which is very nice. All in all, they've been good to work with! So what's next, right? It's hard to say. We're going to continue writing new songs... but more slowly than usual. Why? 'Cause we want this album to be good. Also, with Jesse (and family) in New York still, it can be difficult. As far as new shows go, just keep your eyes peeled. Also, keep checking the shows page... we'll have updates there (as we figure it all out)!